Vodafone Review (2019): Get free meal deals & discounts with popular brands through VeryMe rewards! Vodafone Half Cooked reviews Vodafone’s coverage, speeds and takes a deep dive into their perks to help you decide if the UK’s oldest network has the SIM only or phone contract that is right for you. Vodafone offers customers 99% population coverage & 4G speeds of 20 MB/s, getting the basics right. They have also recently invested in a customer rewards programme to rival those of O2 & Three with VeryMe rewards, giving customers the opportunity to get free/discounted goodies from popular high-street retailers. With tethering and London Underground Wi-Fi hotspots, Vodafone offer a well-rounded proposition. However if you’re looking to get access to the better perks such as 77 inclusive roaming destinations & access to premium subscription services such as NOW TV & Amazon Prime Video, you will have to purchase one of their pricier plans. Click here to go direct to Vodafone’s website and see their latest SIM offers. Otherwise read on for our full review or skip to a specific section from choosing from the table of contents below. Vodafone is one of the big four network providers in the UK, alongside Three, O2 & EE. This means Vodafone has its own network. 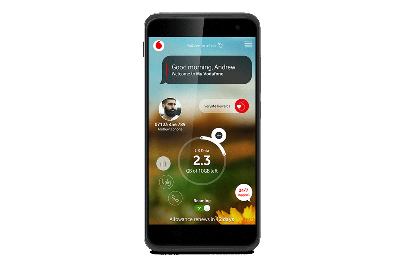 Vodafone has good network coverage with 99% population coverage for 4G, 3G & 2G, however we recommend that you check out the coverage checker on the Vodafone website to ensure that you will get good coverage at home, work & any other places you frequently visit. Vodafone network speeds are also solid. Looking at Open Signals 2018 tests of network data speeds, Vodafone customers get 4G speeds of around 20 MB/s. This puts Vodafone ahead of O2 in terms of data speeds, however they still track behind Three & EE which have speeds of 23 MB/s & 29 MB/s respectively. Generally speaking, you won’t have a problem making calls with Vodafone but recent tests can show us where they perform better or worse. Per P3 Comms recent tests, Vodafone ranked second only to EE. Vodafone showed good results in larger cities in terms of voice call quality and drop rates however fell short in small towns and on the road. Tethering is turning your mobile device into a personal Wi-Fi hotspot which in turn allows your data to be used by other Wi-Fi devices to access the internet. Some networks limit tethering as it leads to heavy data usage and reduces the space on the network, this in turn slows down the network for other users. Vodafone however put no limit on tethering. If you become a Vodafone customer, you can tether your data as much as you want however we recommend keeping an eye on your data usage as you will likely burn through it a lot faster when tethering other devices. With the EU roaming regulation changes that came into effect in the summer of 2017 all UK network’s must now provide all EU destinations inclusive of customers plans. This means 48 roaming destinations are included free of charge to Vodafone customers. However, if you sign up for a Vodafone Red Entertainment Plan you then get access to several additional countries such as USA & Canada. With the red entertainment plans from Vodafone you get roaming in up to 77 destinations but these are premium plans coming at a monthly cost of £20-£20 for SIM only deals. The other option for Vodafone customers is to pay £6 a day to use your home plan to roam in 104 different worldwide destinations, but this could end up getting pricey. 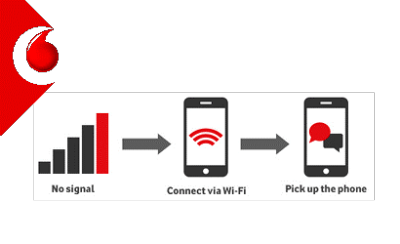 Wi-Fi calling allows customers to place calls and send texts using wireless networks instead of using their 3G/4G network. This is a great perk if you are somewhere without mobile connection but have access to Wi-Fi. Vodafone customers do get access to Wi-Fi calling, however only if you have a pay monthly Red Extra or Red Entertainment plan. Another downside is that Wi-Fi calling is only compatible with certain devices, the list of which can be found on the Vodafone website. Wi-Fi hotspots are common place in many public locations such as restaurants and bars these days. However, being a Vodafone customer means you also have access to several additional Wi-Fi hotspots. All Vodafone customers with a pay monthly plan that has data and PAYG value bundle customers get Wi-Fi on the underground. This provides Wi-Fi access at over 250 stations. On top of this, certain plans also offer customers access to BT Wi-Fi premium spots of which there are over 5 million in the UK. You can check on the Vodafone website to find out if your plan is included. Data rollover means you can roll your unused data from one month to the next. For e.g. if you have a 2GB plan and only use 1GB the following month you will have 3GB as the extra 1GB would be rolled over. 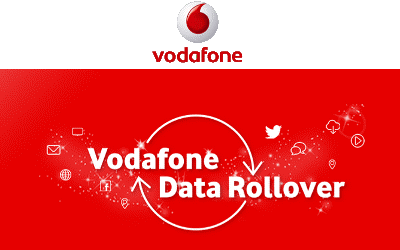 Only Vodafone PAYG customers can rollover their data with the ‘Vodafone Total Rollover’ plans. These are an option for Big Value bundle customers and give the option for any unused minutes, texts or data to be used in the next period. Family plans and loyalty discounts are now becoming common place in the mobile industry, these are used to incentivise customers to refer friends and family to the network. Vodafone performs well here, offering a solid 15% discount to their customers as a loyalty offer. Existing customers get 15% discount on an additional phone, SIM only deal & tablet plans. This is a great option for families which provides one place to manage all the family’s devices & there isn’t a limit with a 15% discount on as many additional plans/devices as you want. You can also refer a friend and earn £25 worth of Amazon vouchers each. You need to send a unique referral link and when your friend has signed up to a pay monthly or SIM only plan (Excluding Vodafone’s Basics plans) and paid two bills, Vodafone will then send you your Amazon vouchers. Some networks are now offering customer perks to differentiate themselves from their competitors to help them attract or keep customers. Vodafone has a pretty new proposition called VeryMe rewards and it is similar to O2 priority & Three’s Wuntu app. It is available to all Pay monthly and Pay as you go customers (Although PAYG customers must have topped up at least £10 in the last 6 weeks). VeryMe rewards offers weekly discounts and giveaways that change dependent on your interests. Some of the offers they have include free weekly coffees, meal deals & discounted cinema tickets. VeryMe provides great value to customers and could have you saving money every week with popular high-street brands. With the mobile market becoming more and more saturated with new networks popping up, some of these operators are trying to differentiate themselves by offering other perks. Inclusive entertainment subscriptions & free data schemes are the typical offers available to customers. 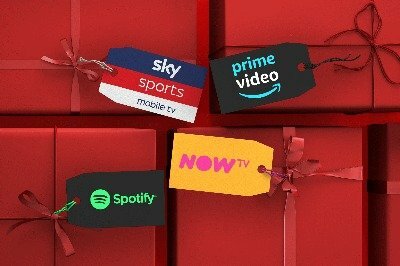 Vodafone offer a free premium subscription from a choice of Sky Sports Mobile, Spotify Premium, Amazon Prime Video or NOW TV and this subscription is offered throughout the length of the contract. However, you can only get this benefit if you are a red entertainment plan customer which has a price point of £20-£20 for SIM only deals. Another benefit of a Red Entertainment or Red Extra plan is a 3-month trial to secure net, which offers anti-virus and blocking of harmful content. After the trial period this is then £1 a month. Free data usage is another offer currently available with certain networks in the market. Vodafone’s sub brand Voxi offer unlimited social media data usage, but this is currently not something offered to Vodafone customers. Vodafone currently have 16 different SIM only plans. There are 8 different 12 month plans & 8 different 30 day plans. These range in price from £11 – £37 and have data allowances ranging from 500MB to 40GB of data. 12 month plans are generally cheaper for similar data and minute offers and also offer better perks such as roaming in 77 destinations & access to premium apps such as Amazon Prime Video & NOW TV. In terms of handsets, Vodafone has a range of devices on offer from budget handsets up to your high-end Apple & Samsung flagships. Vodafone has a couple of options when it comes to PAYG. The first option is a straightforward top up and use with the added perk that if you hit £1 in a day you get unlimited calls, texts & 500MB of data for the rest of the day. The other option is a Big Value Bundle which you pay an upfront amount for 30 days of minutes, texts & data which come at a much better rate. Click below to follow through to Voxi’s SIM only and Phone Contracts. Network Coverage and Speeds – 99% 4G population coverage and 20 MB/s data speeds Vodafone has solid coverage & speeds. Voice Call Quality – Vodafone has performed well in tests with quick call set up times and call quality in large cities. Tethering – No limit to tethering on any of Vodafone’s plans & unlimited social media usage carries over. 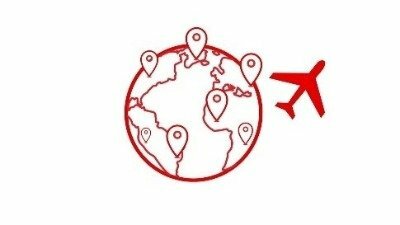 International Roaming – Roaming is covered in the EU for all pay monthly plans, but get access to 77 destinations if you have a Red Entertainment plan. Wi-Fi Calling & Wi-Fi Hotspots – Wi-Fi calling on certain plans, London Underground access for all customers but BT Wi-Fi access to 5 million locations with premium plans. Data Rollover – Data rollover only on PAYG plans. Multi Buy Discounts/ Family Plans – 15% off on family plans or £50 worth of Amazon vouchers when referring a friend. Previous articleVirgin Mobile Review (2019): Get data free messaging on WhatsApp, Facebook Messenger & Twitter! Next articleEE Vs Three: Super-fast 4G speeds or unlimited Netflix streaming? Virgin Mobile Review (2019): Get data free messaging on WhatsApp, Facebook Messenger & Twitter! Tesco Mobile Review 2019: Free data, money off or Clubcard points for families! Sky Mobile Review 2019: Hold onto your unused data for up to 3 years! BT Mobile Review 2019: The network with over 5 million free Wi-Fi hotspots nationwide! Plusnet Mobile 2019: Cheap & cheerful contracts starting at only £6 a month!